On my way back from Burra last Sunday, where I had been doing all things ‘retro, rustic and rare’ at the annual Vintage and Antique Fair, I made a quick stop at Saddleworth. Actually, it was just out of the main town, about a mile north, where I took the narrow winding dirt track up to the old St. Stephen Catholic Church perched on the hill overlooking the town. 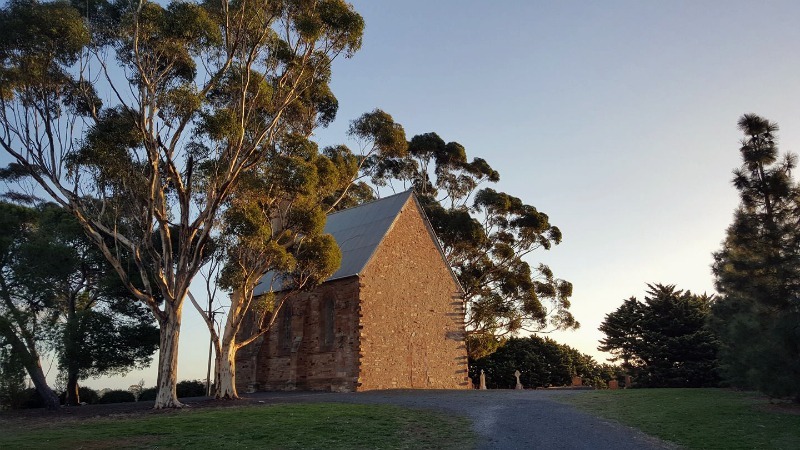 It’s not unlike the historic Catholic Church of the Immaculate Conception and graveyard at Mintaro also perched on top of a hill overlooking the town. 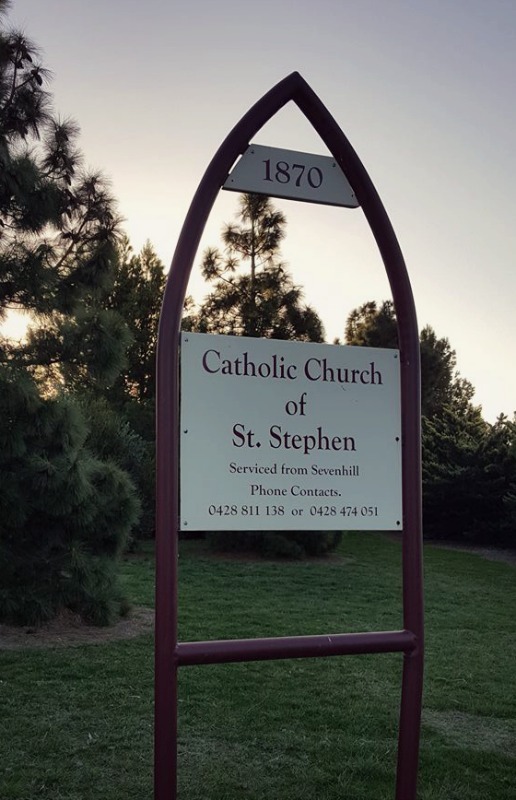 The Church was opened in 1869 though cemetery burials had been conducted at St. Stephens since 1855. It was getting on in the autumn afternoon and dusk was setting in so I really didn’t have time to walk around St. Stephens or visit the graveyard. No time for photos. Another time, another day. Information about the Catholic Church is given in Elinor Bellman’s book “Saddleworth – Hub of the Wheel”, 1995. 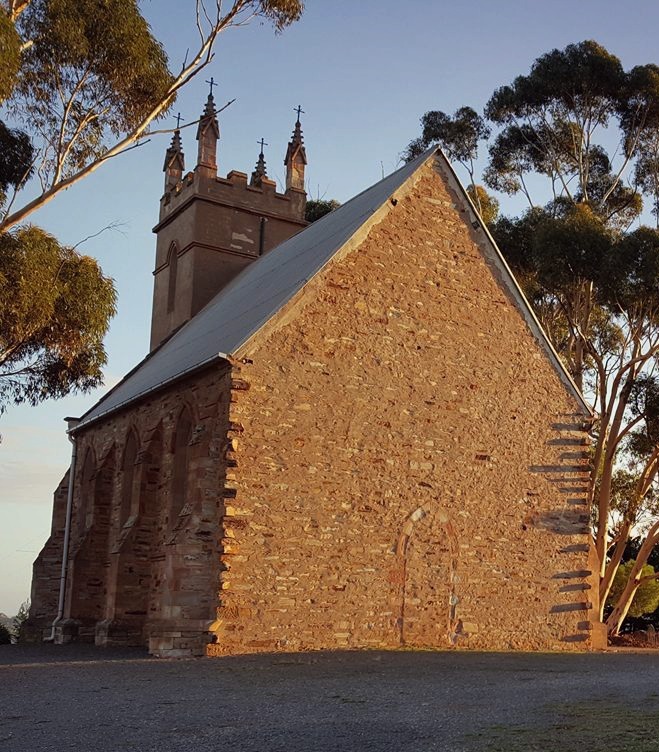 It is called St Stephen’s and was thought to have been designed by Michael McMullen and built by stonemason Joseph Jones of Auburn. It was opened on 16 January 1869 with Father Aloysius Kranewitter as the first (Jesuit) priest. He ministered until early 1870, when he was replaced by Fr Joseph Tappeiner until 1872. 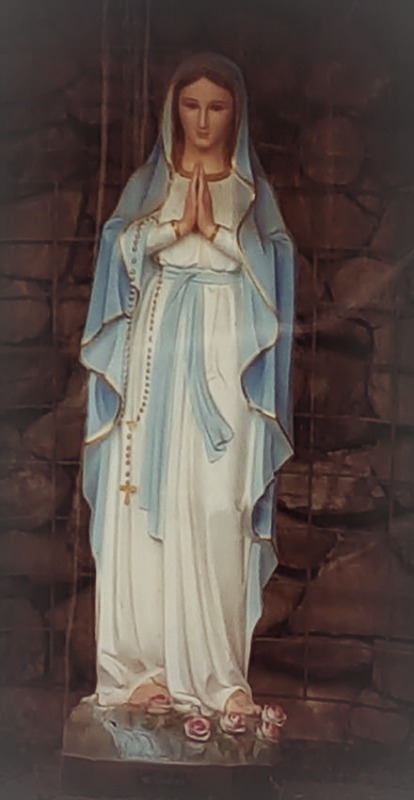 At this time the Jesuit presbytery at Manoora supplied priests for Saddleworth: Fr Joseph Polk (1873- [snip] Then Fr Patrick Walsh (1950-1951), Fr Thomas Pius Ormonde (1951-1962), Fr Kevin Hay (1962-1974), Fr Patrick Gleeson (1974-5), Fr Thomas Daley (1975-1980), Fr Ruane (1980-1983), Fr William Kelly (1983- ). More info from Adelaide Archdiocese Archives. More information here. In this view, I’m looking west into the sinking sun and a silhouetted guardian angel watching over the graveyard. 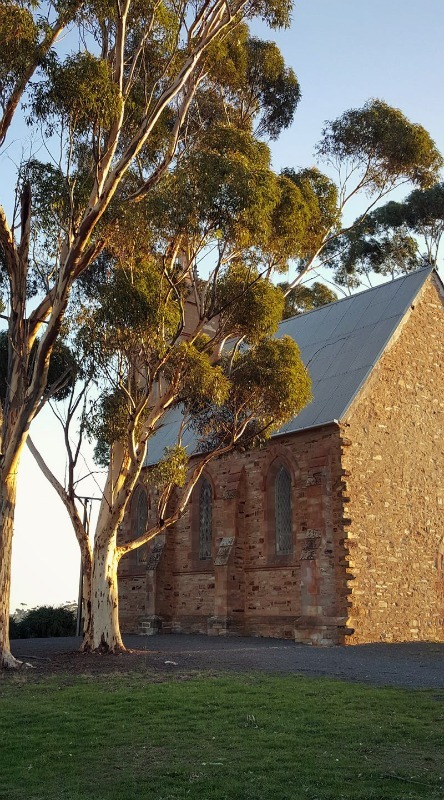 So pretty, calm and peaceful with conifers and large gum trees surrounding the church and cemetery. 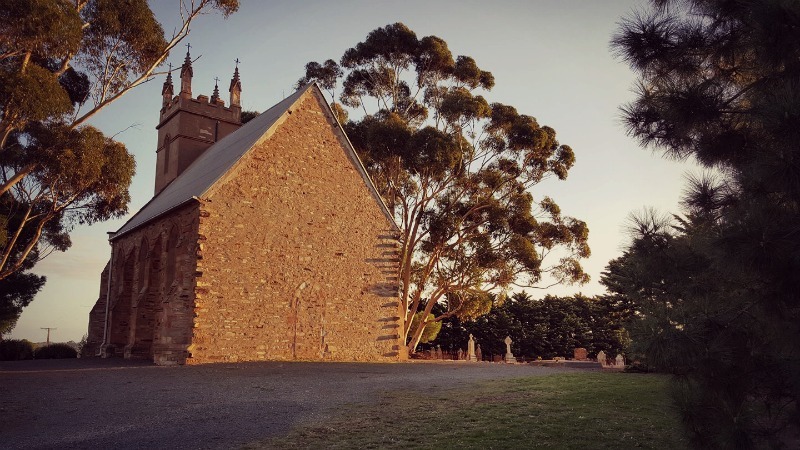 I talked earlier about my visit to the local Barossa Angaston cemetery here. 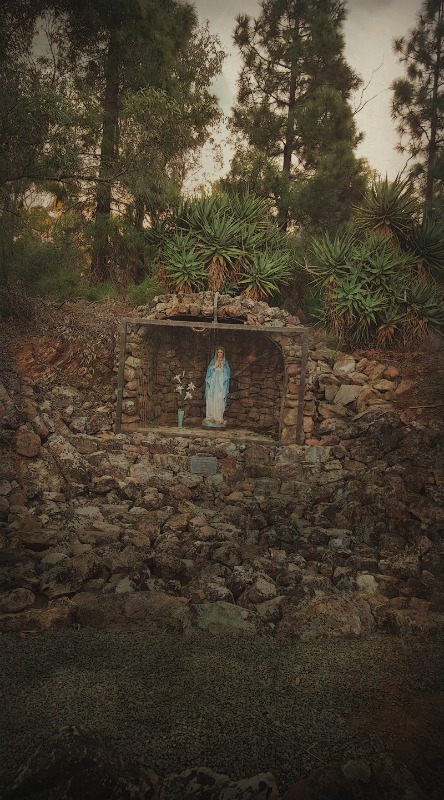 Someway up the winding track you find this little grotto where venerating Mary seems to pray in earnest for those of us with wicked souls and/or beyond redemption! Praying for our purification perhaps. Normally there’s water trickling over the stones but apparently the system had been turned off as there was no water in sight. Rear view of the Church and what you see when you enter. The graveyard is on the right. 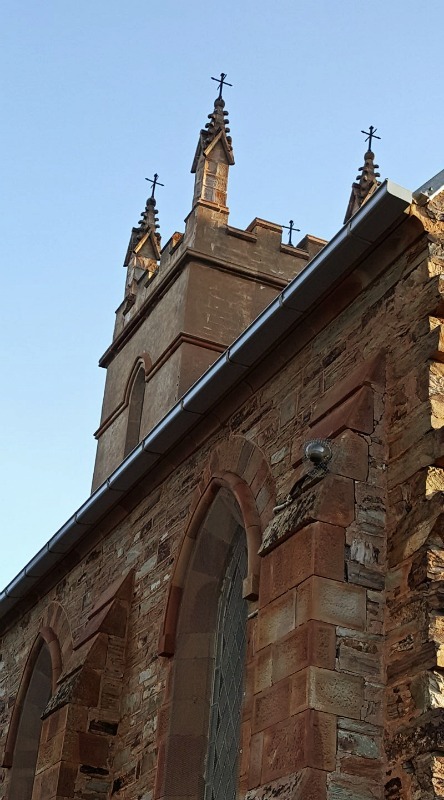 The front of the Church is on the opposite side overlooking the town of Saddleworth. As I say, no time to get around the Church or cemetery.